Cineworld has said the acid attack outside its Crawley site was an ‘extremely rare’ incident. A 27-year-old man was left with ‘life-changing’ injuries after acid was thrown over him outside a Crawley cinema on Sunday (August 30), police said. A spokesman for Cineworld said: “We were concerned to hear about the incident that occurred in the car park outside Cineworld Crawley and our thoughts are with the man involved. “We are working closely with the Police to assist their investigations. Sussex Police appealed for witnesses to the assault which happened 1am and 1.30am. A spokesman said it was thought the incident may have started when the victim and another man, 29, also from Redhill, were watching rap movie Straight Outta Compton in the cinema. The suspected assailants are two white men in their late 20s or early 30s. One had dark short hair and beard wearing a bag across his shoulder, the other was wearing a white/light grey hoody and jeans. Both were in a dark-coloured Peugeot car. Detective Sergeant Laura Diamond, of Crawley CID, said: “This was an isolated but nevertheless nasty and unprovoked assault. The victim, from Redhill, was taken to the East Surrey Hospital for treatment. Due to potentially life-changing injuries from the corrosive liquid, he was later transferred to the Queen Victoria Hospital, East Grinstead, for specialist care. 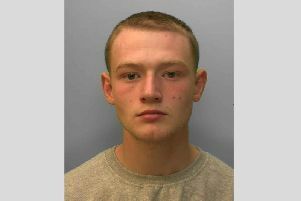 Information can be emailed on 101@sussex.pnn.police.uk or telephoned to 101, quoting serial 120 of 30/08. Alternatively people can contact the independent charity Crimestoppers without having to leave their names on 0800 555 111.